Even the most beautiful homes tend to look a little outdated as the years go by. If your house is due for an upgrade, the new Trinsic™ Series windows and patio doors from Milgard are designed to bring your home into the twenty-first century with a brand new, more contemporary look. Or, if you’re planning to build a new home, the Trinsic Series will create a crisp, clean appearance with a decidedly modern flair and the maximum amount of natural light in every room. Unlike older style windows with thick, heavy frames, Trinsic Series contemporary vinyl windows boast narrow frames that allow you to enjoy stunning outdoor views with little interference or distraction. The hardware is so discreet that you almost don’t even know it’s there, but at the same time, the windows are dependably easy to open and close, usually with a single motion. 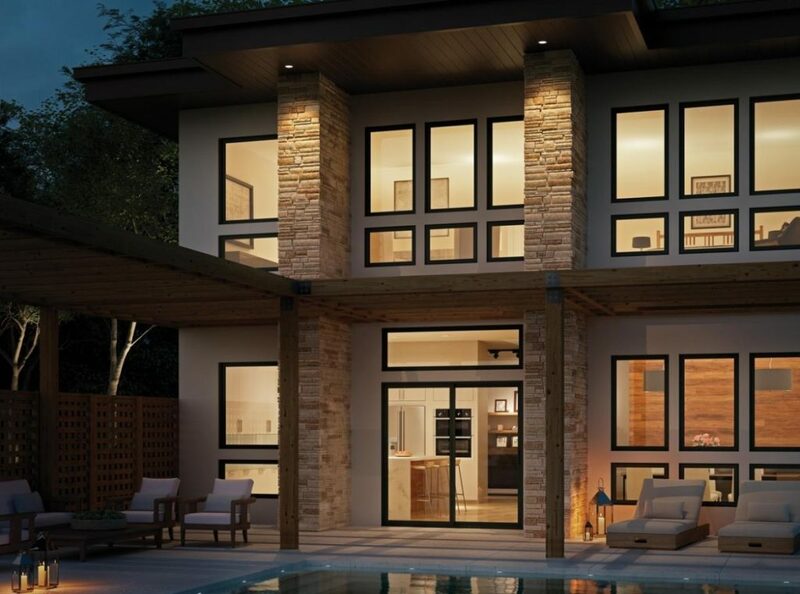 Trinsic Series windows are created to maximize natural light throughout the home while creating a warm feeling and a connection between the indoor environment and the great outdoors. Trinsic Series picture windows, created so that nothing stands in the way of the stunning view, are an unmistakable focal point in any home. That’s just the beginning, however, as Trinsic Series offers a variety of styles, including single-hung windows that open and close in a smooth up and down motion, horizontal sliders that are easily locked and unlocked, or double horizontal sliders that open from both sides with a fixed sash in the center. Casement windows that swing outward like a door are just the thing for upper floors or exterior areas without walkways. Awning windows, hinged on top, are opened and closed with a simple turn of the handle, perfect for maximum ventilation, even when it’s raining. If you’re looking for something a little different, radius windows, rounded on the top, add a stylish, whimsical feel, or they can soften a room with a few too many hard edges. No matter what window style you choose, it will pair well with Trinsic Series vinyl sliding patio doors. Like the windows, sliding doors provide the maximum viewable glass area with nothing to obstruct the view. Select a slider with two, three or four panels and a variety of attractive exterior colors. If the light is a little too intense, several shades of tinted glass are available. You can also opt for Pureview screens, which, according to happy homeowners, practically disappear. You have a number of options available within the Trinsic Series that can add contemporary style to your home. Get started today and enjoy your new upgrade. The above article was sponsored by Milgard Windows & Doors. The information contained in this article may contain ads or advertorial opinions.